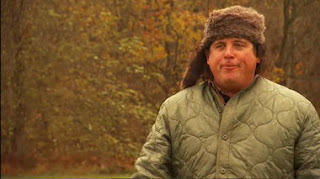 Finding Bigfoot's investigator James 'Bobo' Fay. Part commercial fisherman, part surfer, part squatch caller. MassLive.com has an intriguing article hinting at the longevity of Finding Bigfoot by comparing it to the popular series Ghost Hunters which has 8 seasons underneath it's belt. Another interesting note; Cliff Barackman [of CliffBarackman.com and NorthAmericanBigfoot.com] is described as the oddest member of the Finding Bigfoot Group. Once again, Cliff Barackman is singled out as the level-headed one. Published: Monday, January 16, 2012, 4:04 PM Updated: Monday, January 16, 2012, 4:24 PMby Laura Merwin, MassLive.com As Matt Moneymaker proclaimed in a recent episode, “I do believe there’s a squatch in these woods!” the Animal Planet’s ‘Finding Bigfoot’ is quickly starting a revival of interest in the forest-dwelling, elusive beast known by several different names such as sasquatch, yeti, bigfoot and swamp ape. While the investigative team that spends hours tramping through fields, forests and swamps in pursuit of the elusive creature have yet to proclaim Bigfoot ‘found’ the Animal Planet is doing quite well for itself by bringing the search to living rooms across the country. Matt Moneymaker: The self-proclaimed leader, Matt Moneymaker is the founder of the Bigfoot Field Researchers Organization (BFRO) which has been looking for bigfoot since 1995. Moneymaker is best known perhaps though for his prolific use of the word ‘squatchy.’ As in “These woods certainly feel squatchy.” And “Who would have thought that Rhode Island was so … squatchy.” While he proclaims himself the leader of the group, the group has other ideas and not one of them is in agreement but the term ‘arrogant’ and ‘He’s not my leader.’ has been thrown around in some episodes. James ‘Bobo’ Fay: I kid you not, Mr. Fay’s nickname is in fact ‘Bobo.’ I’m just going to sit here while you make up your own jokes on that one. I’m sure you can come up with at least 3 good ones and you haven’t even seen his hair yet. Bobo’s bio has him as a California surfer turned commercial fisherman. On the show Bobo is the resident ‘Bigfoot stand in.’ Whenever the team wants to get an estimate of how big the creature was in a witnesses sighting they invariable send in Bobo to play the part of the creature, you know, mainly because they’ve never captured a Bigfoot and been able to get him to stand in for himself. Ranae Holland: Ranae is the group skeptic. A research biologist, Ranae is the one member of the team that actually has some real credentials and she’s not afraid to use them. Various episodes have shown Ranae calling out suspect witnesses on camera but to her credit she doesn’t just laugh at their stories and walk off, she sticks around and investigates, even though she knows that it’s futile and dons the obligatory ghillie suit and spends hours sitting in a tree with nothing but a bunch of squirrels for company. That is dedication. The locations that the team investigates will more than likely prove to be the stars of the show, well, that and the eye witness’ stories that a crack team of computer artists bring to life via Bigfoot-infested cgi while Matt Moneymaker and the crew fill us with bigfoot facts. Bigfoots come in as many hair colors as people do, presumably in champagne blonde as well as beautiful brunette and glittery gingers. Bigfoots go grey as they age as several white bigfoots have been spotted. Southeastern Ohio is the retirement community of Bigfoots, much the same as humans move to Florida. Baby bigfoots like to climb trees but adults not-so-much. Rhode Island is exceptionally squatchy. ‘Finding Bigfoot’ is quickly growing in popularity on the Animal Planet channel, once again proving that it is not the ‘finding’ but the ‘thrill of the chase’ that has the entertainment value. For proof one need only look to that amazingly popular show ‘Ghost Hunters,’ who in 8 seasons, have yet to produce even one jarful of ectoplasm, nevermind a headless horseman. I’m sure ‘Finding Bigfoot’ will find its audience quickly even if it doesn’t manage to find Bigfoot, even if that audience is more interested in doing a shot of banana flavored brandy every time Moneymaker invokes the term squatchy or Bobo lets loose with a heartfelt squatch mating call. I hope so. It would be great if the could find some very hard evidence and submit it to Congress. Make Sasquatch a protected creature. Pass a law Nation wide that you can not harm capture a Sasquatch. The headline alone brings shivers to my spine. i think the producers of finding bigfoot are using the wrong people to find sasquatches. if anyone could find the sasquatch. it would be the I.R.S.! I know where he is, I work with him, 6 foot 10, 395 lbs, hairy as an Azores fish, eats all day and farts noxious gas that would make Saddam Hussein oh so proud. He hates the sun light, after 2 dozen beers howls at the moon and sleeps in front of his computer most of the day. Has a large and protruding cranium and unibrow, walks huntched ower and has size 15 shoes. He is masquerading as a human, never speaks and only grunts. The IRS does not locate people. They just locate their money. Do not send the USPS either. I would place more faith in Dog the Bounty Hunter or FedEx than any government organization. I'm sorry, I wanted this show to be awesome. However, after the first season it was evident to me that there was no scientific investigative techniques being used whatsoever to verify or debunk these sightings. At least Ghost Hunters debunks the heck out of most of their investigations and are not afraid to say, "I don't think this place is haunted." The team of "Finding Bigfoot" with the exception of Renae, has no problem proclaiming every noise, imprint on the ground, or bend bird feeder as a squatch. I had to stop watching the show after the first season because my wife got sick of hearing me yell and scream at the tv. By the way, just as a side note, Bobo is hilarious and is the best part of the team. This show is a joke. This select team is even a bigger joke. they couldn't find a whore in a whorehouse. 40+ episodes, visited 30+ states and they found NOTHING!